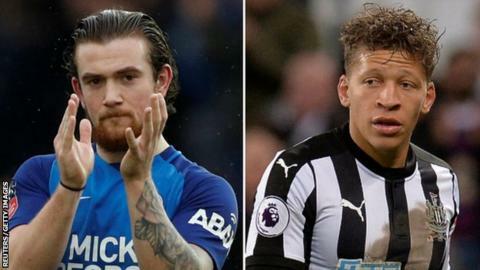 Peterborough United manager Steve Evans has compared the goalscoring exploits of Jack Marriott to Dwight Gayle's record while at the club. Marriott, 23, is League One's top scorer and got his 31st goal of the season in Posh's win over Northampton. Gayle, 27, now at Newcastle, scored 13 times in 29 games for the club before joining Crystal Palace for £6m in 2013. "If Marriott's in a Championship side that makes chances he'd be the league's leading goalscorer," Evans said. He told BBC Radio Cambridgeshire: "This boy's up there with the Dwight Gayles of this world and he (Gayle) was exceptional." Former Luton striker Marriott joined Peterborough in June 2017 and has 25 league goals this term - six more than Portsmouth's Brett Pitman, his nearest rival. Speaking after Marriott's 98th-minute equaliser at Rotherham on Good Friday, Evans said: "One thing we have is, just simply, the best goalscorer I've ever worked with. He's absolutely stunning. "That young man is most likely going to go and join an absolutely huge club in the summer - that's unless the chairman continues to do what he did in the January window when he was turning down, I think, around £6.5m or £7m. "I've said to you he's better than some of the strikers I've worked with, and I've worked with Chris Wood at Leeds, but Marriott is the best finisher I've ever worked with."